Make It Original: THANKS TO ALL THE FIRE FIGHTERS. THANKS TO ALL THE FIRE FIGHTERS. 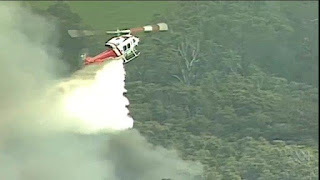 I did say that our grandson was flying one of the helicopters that was fighting the fires, I finally, with a lot of effort managed to get a photo of the helicopter that he was flying. I saw him a lot on the news but until I got the photo I did not know which helicopter he was in. Apparently based in Kyneton he was helping to put out the Lancefield fire. Here he is below, we are very proud of him. Thank you to all the firefighters they did a brilliant job with a lot of risk to themselves. Next time I post hopefully it will be to add more Liberty fabrics which have been very popular, thank you to the ladies who sent me such great comments.